Re-take a cargo ship from the Locust, by utilizing night vision, in order to save civilians from the continent getting slagged by COG. "Albatross" is the second level to a theoretical single-player campaign for Gears of War focused on the time after Emergence Day but before the COG began their scorched earth policy. "Albatross" takes place during a thunderstorm on the neglected shipping vessel Albatross; the last hope for a group of Stranded and COGs to escape the Locust hordes and Hammer of Dawn attacks by going out to sea. 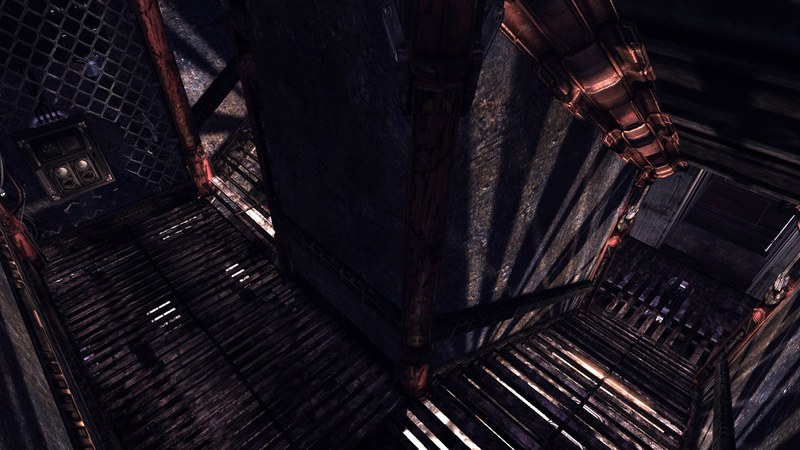 The player must clear the ship of locust and navigate the bowels of the ship to restore the engines. 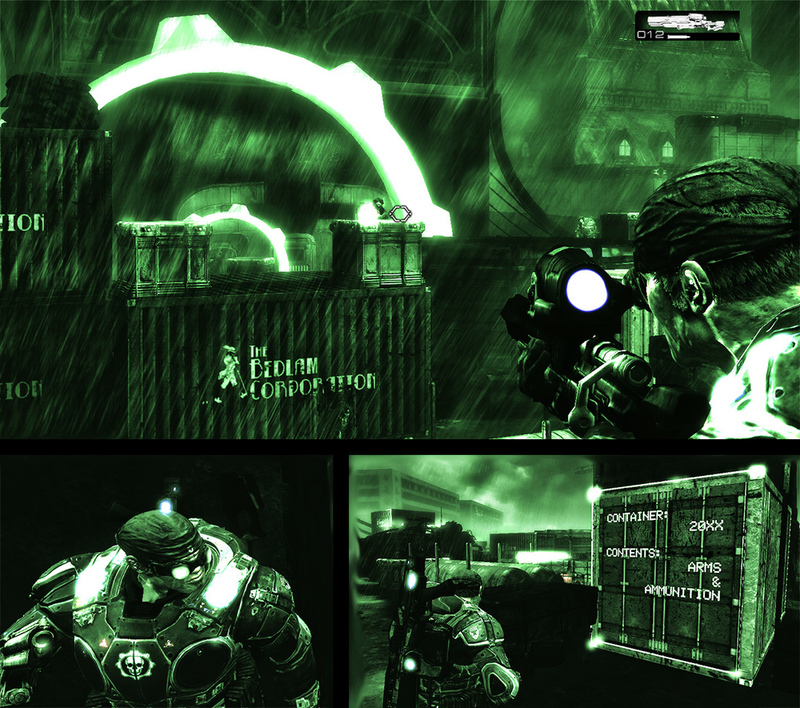 Unlike other Gears of War levels, the player has access to night-vision that displays world information, objectives, and highlights enemies and important objects. Creating the hull and cargo doors for the Albatross made the front-end of this project a lot longer than it normally would have been. However, I feel it actually helped me speed up the rest of my process by having the playspace well defined by the ship's size. By taking the time to get the size and shape of the Albatross right, I was able to lock in the dimensions of my playspace early. I was able to save time on the custom assets for the Albatross by texturing them with materials from Gears of War. This also allowed them to blend in better and not seem like custom assets. With the playspace defined by the hull of Albatross, it became easier to orient cover, spawns, and item locations. Another part of the environment I wanted to focus on was sound, particularly the contrast between being on the deck and in the ship itself. This was accomplished by changing reverb volumes, muffling the rain and lighting, and adding an occasional deep creaking sound when the player entered the ship. I was able to save time on the custom assets for the Albatross by texturing them with materials from Gears of War. The deck and hold areas have matching soundscapes, but are modulated to give the appropriate elements more or less presence. Creating the Night Vision mode for "Albatross" was fairly easy. It was accomplished by toggling a post-processing volume and a bright sky-light set to light only character actors (or anything placed in those channels) via the "Q" key which was normal used for the player to look at a Point of Interest (POI). POI's were replaced by objects that would receive extra lighting via the character sky-light and the paths to them were indicated by rotating holographic gears that would be streamed in based on mission progression. The Night Vision mechanic for Albatross proved to be easy to implement, but difficult to refine. What proved the most difficult, and thus the most time consuming, was tuning the post-processing volume and sky-light. It couldn't be to washed out, but targets needed to be visible enough. It also needed to be the right tone of green as well or it bothered players. The weather effects made it a little more complex as well. The lighting was accomplished by toggling a post-processing volume at short, random intervals. This meant that Night Vision need its own version of the lighting post-processing in order to seem like it was amplifying light. I was continuously tuning these values and timings until the end of the project to try to get them to feel right, and I feel it paid off.